An unusual logic action game in which the realistic physics engine is the main element. It was developed by No Brakes Games, a Lithuanian studio. The protagonist of Human: Fall Flat is an ordinary man named Bob. 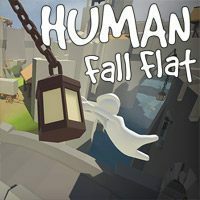 Human: Fall Flat for PC, PS4 and etc. is an unusual logic action game in which the realistic physics engine is the main element. It was developed by No Brakes Games, an independent studio established in 2012 in Vilnius which previously developed several simple productions, mainly for Windows 8 and Windows Phone. The protagonist of Human: Fall Flat is Bob, an ordinary man that has no superpowers whatsoever but can achieve many things by using the right tools and his creativity. Our task is to help him resolve the mystery of dreams about falling that haunt him. We are taken to a slightly surreal world of Bob’s dreams, where he has to face his own fears while traversing 8 incredible lands filled with varied puzzles and obstacles. While playing, we observe the action from the third-person perspective, and our task is to explore open locations and to solve subsequent puzzles by experimenting with objects in the environment. Everything is governed by the realistic physics engine that determines the way of protagonist’s movement as well as behavior of all items. The consequence of that is, among other things, an unusual controls model that requires a lot of practice to master because we control a quite inert character, which somewhat resembles the solutions from such productions as Gang Beasts. Its main advantage is the full freedom of movement as well as no scripts and limits whatsoever. It also allows the protagonist to interact with the environment in an incredibly big number of ways. He can pull up, climb, and grab various edges. All encountered items can be picked up, pushed, pulled, or thrown. The gameplay is designed not to impose any specific way of doing things but to reward creativity and the ability to think outside the box. Thanks to this, the game can be replayed multiple times without the feeling of boredom, applying different ways of solving to the same problem. Apart from single player, Human: Fall Flat features a local cooperation mode for two players in which we can traverse the game world together and solve encountered problems together. Because of a large inertness of characters, co-op play creates opportunity for many funny or unusual situations. Human: Fall Flat for PC, PS4 and etc. offers nice although quite simple graphics. All objects were built from a small number of polygons, while the protagonist looks as if he is made of plasticine. What’s interesting, it is possible to customize him, for example, by importing textures from real world via a webcam.